It was a bit surprising that, as well as being a consistent multi-platinum selling group that turned everything to gold (platinum, really) that they touched, that these guys were also an incredible live band. 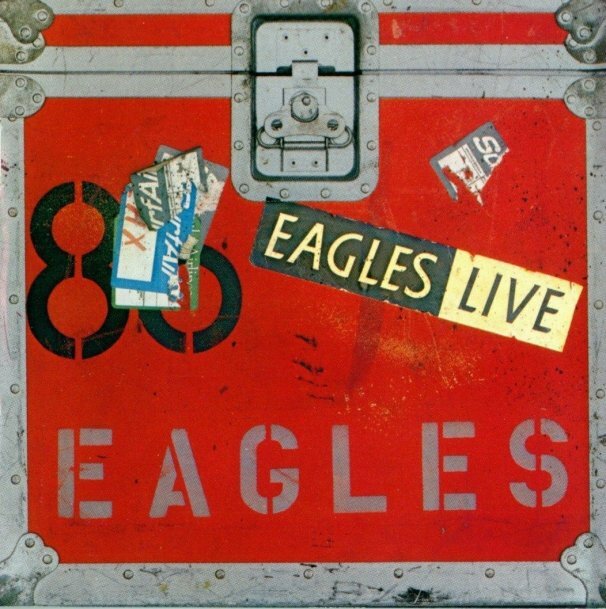 I say "a bit surprising" because when looking/listening at a band like The Eagles, they don't really seem to fit the description of a stellar live group. They never had the energy and mobility of a Springsteen, nor did they have a theatrical flair like a band such as Kiss. They were simply five laid back guys in jeans, standing mostly still and giving each song everything they had. And they had an awful lot. It was easy to see that these guys took their music very seriously, and tried as hard as they could to replicate their songs as true to the original as they could, while still retaining a certain amount of originality necessary for a great show. It was then a bit of disappointment with this, their first ever, live release, simply because it really didn't show anything that made these guys or their performances so magical. It was pretty well known at the time of this release, that the guys were officially "over". So this release was probably originated to keep the lawyers happy. The songs sound good - almost too good. Many of the songs sound as though they were heavily overdubbed and the aura makes you feel as though the guys were just going through the motions. Since they toured with a string section on their previous tour (supporting Hotel California), they feature a heavy amount of material on this album from that tour, and where it sounds o.k., the string sections just sound too perfect, and one can't really imagine it sounding this good back in 1976. Even at the length of a double album, there's a lot of great songs missing here. The only sin in the song selection is including a couple of Joe Walsh solo songs. O.K., so Walsh is an Eagle, but, at the very least, have him sing one or two of his Eagle songs. Beggars have to be choosers. So there are a lot of hits here, but there are occasional nice surprises, such as Saturday Night from Desperado and Wasted Time from Hotel California, the rest is pretty much as one might expect, although they tend to favor the latter part of the career. The one "new" song (although they had performed it for a couple of tours) is the Steve Young written Seven Bridges Road which shows off the five part harmony quite well and actually was a very minor hit that was released as a single to support the album. So early in their career, this was the only way you could know, or remember, what this band sounded like live. While adequate, you have to agree it was a bit bland.